As I noted a few weeks ago, today is National Voter Registration Day – and from the looks of things it promises to be quite a day. Not only are celebrities adding their names and voices to the cause (see Headcount.org’s photo archive for a sampling) but election officials are getting into the act as well in an effort to register as many voters as possible before deadlines start to fall early next month. In Los Angeles, Clerk Registrar-Recorder Dean Logan will be hosting a press conference with Taboo of the Black Eyed Peas, and in New York City, actress Rosario Dawson will be co-hosting a “Youth Voter Registration Jam” with NYCVotes! Elsewhere in the country, election offices will be partnering with community organizations and other groups on registration drives and other events. To find one in your area, click here to see the official list curated by the folks at National Voter Registration Day. You can also follow today’s action on Twitter by following 925NVRD or searching under the hashtag of the same name. There is also a Facebook event page which has details as well as updates from users and organizations across the country. Of course, once the day is over it’s back to the heavy lifting of getting ready for Election Day, but I’m happy to see the people with the cool jobs get to be the cool kids – even if it’s just for one day! 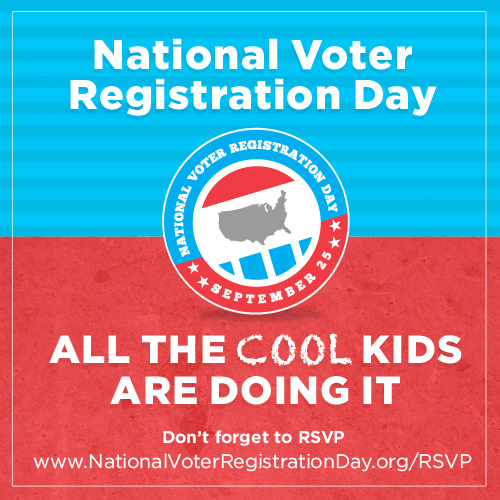 Be the first to comment on "Cool Kids Today: Election Officials Join In the Fun of National Voter Registration Day"